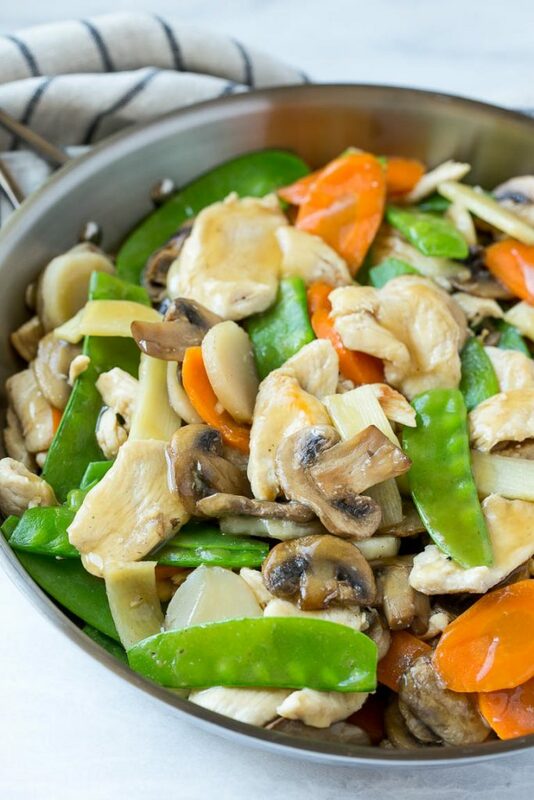 This recipe for moo goo gai pan is a classic dish of chicken and vegetables stir fried with a savory sauce. Plus secret tips on how to make your stir fries taste like they came from a restaurant! Have you ever ordered moo goo gai pan at a Chinese restaurant? 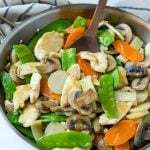 It’s a simple chicken and vegetable stir fry that’s super flavorful and also on the healthier side. 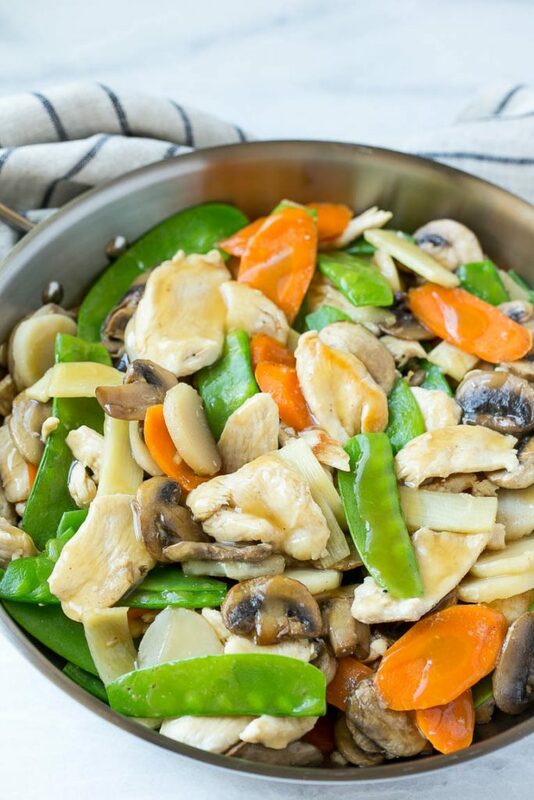 I first tried moo goo gai pan about 15 years ago while on a date with my now-husband. I had never had it before but he insisted we order it and I’m glad that he did. 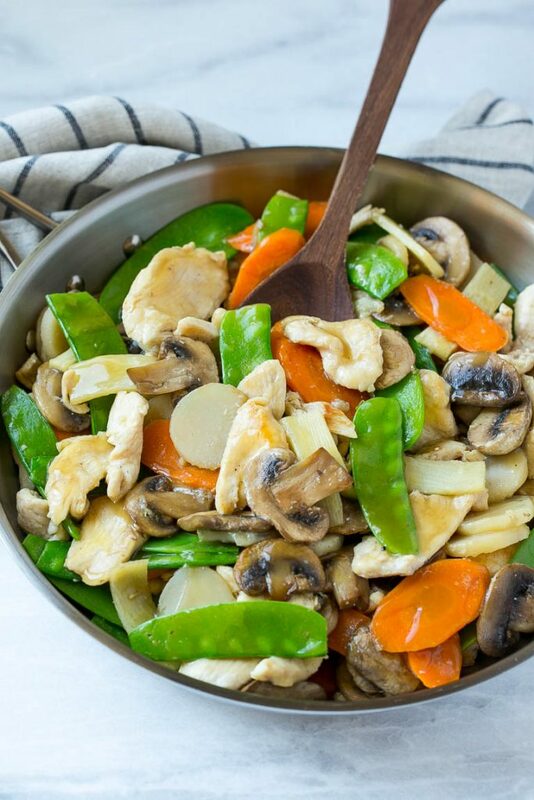 Moo goo gai pan is essentially chicken with mushrooms, along with some other veggies that seem to vary depending on who is preparing it. When I order a chicken based dish at a Chinese restaurant, the meat is always very thinly sliced and super tender, but I could never figure out how to replicate that at home. Luckily, after a little research, I realized that it’s actually quite easy to get thin and tender chicken pieces in your own kitchen. The first step to getting restaurant-style chicken is to cut your chicken into very thin slices. The easiest way to do this is to freeze the chicken breasts for about 20 minutes, or just until they firm up – you don’t want them frozen solid, but you do want them hard enough to easily slice. Cut your chicken against the grain (width wise) into strips. The next step in the process is a technique known as velveting – the chicken takes a quick dip in a cornstarch and egg white mixture which makes it extra tender. This extra little step is well worth it for a restaurant style end result. The sauce for this moo goo gai pan recipe is so incredibly simple, but it really ties all of the flavors together nicely. Serve this moo goo gai pan with a side of rice and skip the take out menu tonight! 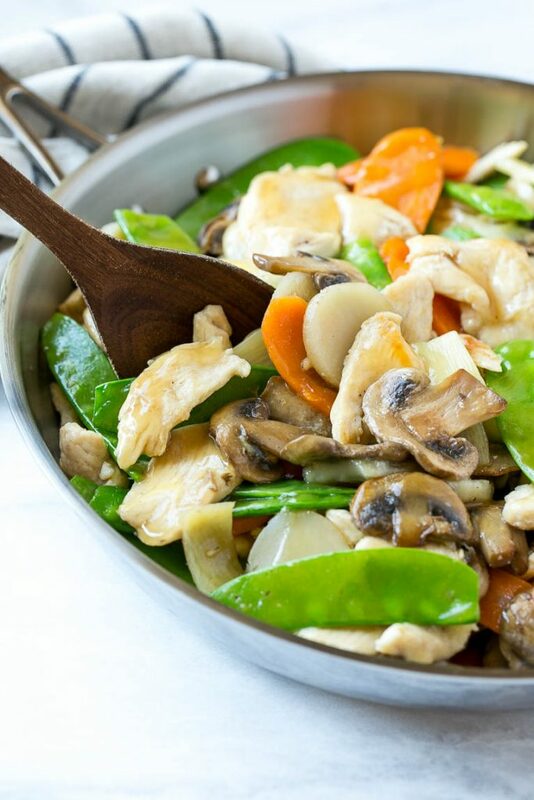 This recipe for moo goo gai pan is a classic dish of chicken and vegetables stir fried with a savory sauce. Plus tips on how to make your stir fries taste like they came from a restaurant! In a medium bowl whisk together the egg white and 1 tablespoon of cornstarch. Add the chicken slices and toss to coat. Refrigerate for 30 minutes, then strain and discard any excess liquid. In a large saucepan, heat 1 teaspoon of oil over medium high heat. Add the carrots and 1 tablespoon of water and cook 2-3 minutes, stirring constantly. Add the mushrooms and cook for 3-4 minutes or until mushrooms are browned and tender. Add the snow peas and cook 1-2 minutes more or until tender. Stir in the water chestnuts and bamboo shoots. Season the vegetables to taste with salt and pepper. Remove the vegetables from the pan and place on a plate. Cover the plate with foil to keep warm. Wipe out the pan with a paper towel. Heat the remaining 2 teaspoons of oil over medium high heat. Add the the chicken to the pan and season with salt and pepper to taste. Cook, stirring occasionally, until chicken is cooked through, 3-4 minutes. Add the garlic and ginger and cook for 30 seconds more. In a small bowl whisk together the chicken stock, sugar, soy sauce and sesame oil. Whisk in 1 tablespoon + 1 teaspoon of cornstarch. Add the vegetables back to the pan and heat through, approximately 1 minute. Pour in the sauce and turn the high to heat. Bring the sauce to a boil and boil for approximately 1 minute or until sauce has just started to thicken, stirring occasionally. Serve immediately, over rice if desired. This tastes like we carried it out of a restaurant. Very good! Will make this again soon. Thanks for sharing! I made this tonight for supper and ….Oh my goodness, this was DELICIOUS! And the first thing I’ve ever made that actually tastes like something that actually would be served at a Chinese restaurant. I’ve tried other recipes and they’ve never hit the mark. Velveting the chicken is a game changer. I doubled the sauce since I like to have extra. Definitely will be added to the meal rotation. Thanks for the great recipe! Just made this tonight! So legit! Best Moo Goo I have eaten in years!!! Thank you! Made it for dinner tonight and it was wonderful! I had previously tried a different version which was not like this at all. I loved it so much, thank you! Made this for lunch today. Was so incredibly delishious. We used bok choy and yu choy and topped it with roasted cashews. Will deffiently make it again. So happy to hear you enjoyed it, I love the idea of adding cashews! I tried this recipe today it was loved by all the family members. It is a keep . I had a query Can the water in which the chicken has been boiled be used as stock . Thank you for the recipe. Glad you enjoyed it! I’m not quite sure about the question as this recipe doesn’t call for boiling chicken, can you clarify? Thanks! Super easy and tasty dinner. Thanks for the great recipe! 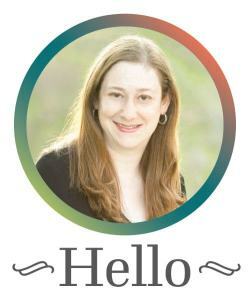 I made this and loved it. I always throw extra vegies in and I found it wasn’t saucy. Can I double the sauce recipe only to give it a saucier finish?